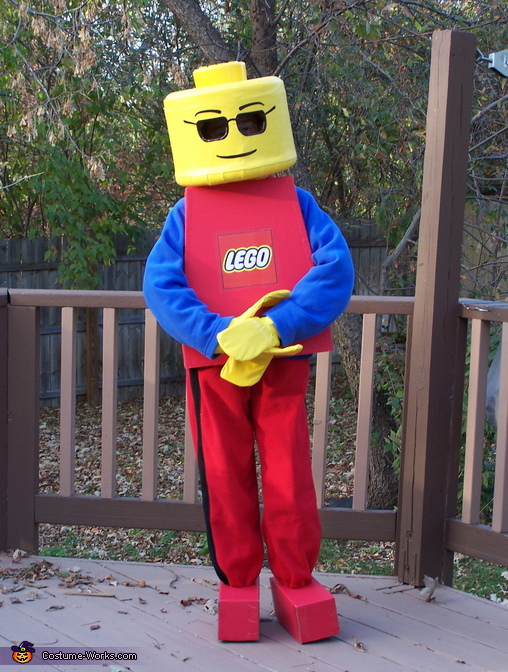 This is my 9 year old son, Dominic as a Lego Minifigure. We made the head out of a hat box and a yellow flannel-backed tablecloth with a Sharpie for the face. The top is actually off his Lego sorter. The body and feet are made of cardboard with a blue shirt for sleeves and red sweats for the legs. I would if I had any. We used cardboard for most of it. The head was created using a cardboard hatbox and floral foam rings to create the rounded edges. The actual top is from my son's Lego sorter. I drew the face on the computer, printed it out and placed it under the fabric on a light table to trace it. I used an Xacto knife to cut it out.